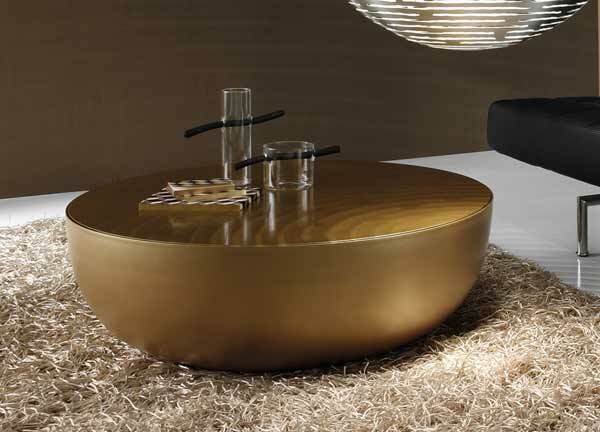 There's an old saying that says "Nice girls don't have gold coffee tables." Okay, that's a total lie and there is no such saying... 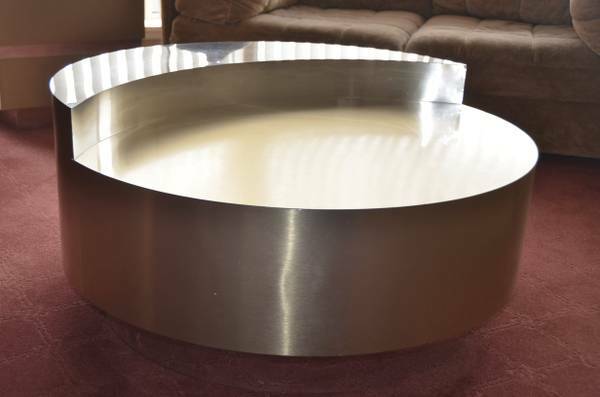 Still, I don't know what but I still have trouble wrapping my head around a coffee table that isn't black, white, wood, glass or some kind of silvery metal. I decided to step outside of my comfort zone and try something really different. I used this modern table (top picture) from Go Modern as my inspiration and scanned Craigslist for a table with a less heart attack inducing price. Remember this post about my Craigslist and Kijiji favourites du jour? I mentioned that I was considering purchasing one of my finds. Well... I ended up deciding (after some price comparisons) to take the plunge. The owner of this baby (below) was letting it go for a more modest $150 and... get this... it swivels! Corey thought it might be a little ugly gaudy but we both agreed that it would help to keep our more mature living room in the new house from looking too grown up. I've always wanted a navy blue living room and I think gold accents will warm it up. We've enjoyed tons of chrome for the past three years but, since we've already sold our coffee table and many other items, it's time for our next living room to sparkle with something a little more glamorous. I think it will be complimented by some jewel toned textiles and accessories. I know this table won't suit everyone but I kind of like that it's "a little too much" since it makes me laugh. We were worried about some of the edges around children but I suppose we'll cross that bridge when the time comes.... Or we can just put some helmets on our future kids and let them use it as a merry-go-round! ... Don't worry, I'm just kidding (sort of) but the table really does swivel!